The Sports Video Group held its first event in Australia this week at the Telstra Customer Insight Centre in Sydney. 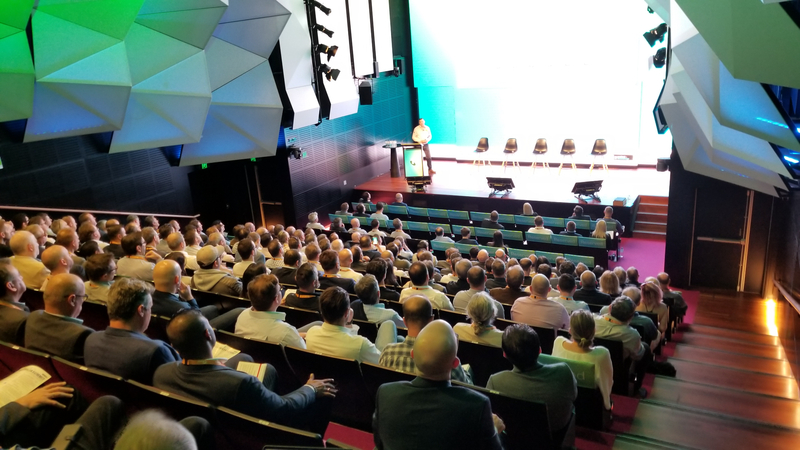 More than 230 sports-industry professionals gathered for an afternoon of panel discussions and presentations on the future of the sports-media industry from a technical and production perspective. Attendees were from across the professional-sports spectrum: networks, leagues, teams, remote-production services, manufacturers, OTT, esports, system integration, and venue operations. Marc Segar, NEP Australia, Director of Technical Services, takes to the stage to discuss the ins and outs of the NEP Andrews Production Hub. The facility takes advantage of fiber connectivity, SMPTE-2110 IP standards, and more to allow for distributed production workflows to become a reality on a day-to-day basis for NEP and its clients. Learn how the project came about, the technologies that drive it, and what it means to the Australian sports production community. The concept of sports broadcasting continues to evolve on an almost daily basis as technologies like VR, AR, UHD, HDR, and OTT redefine the way content is captured and delivered to consumers. What’s on the mind of top executives from the sports broadcasting production community? Remote production allows for the broadcast of more sports with more consistency, reducing operational costs while ensuring reliability, flexibility and scalability. This presentation introduces Telstra’s Distributed Production Network (DPN), which has enabled broadcasters to revolutionize the way sport is produced from distances of up to 3,500 kms. Carl Petch, one of the leading experts in remote production networks, will share the experience of developing, testing and launching the Telstra DPN in Australia. 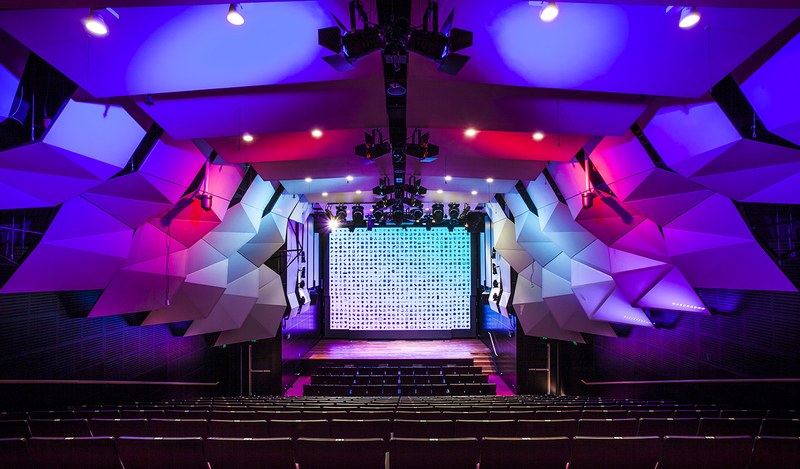 Australian remote production services providers NEP and Gearhouse have recently opened up new facilities that give clients a new option when it comes to producing an event: producing the event away from the venue. Learn more about their projects, the key technical components, and what they mean for the way production teams go about doing their jobs. Is your sporting business ahead of the game in technology? Are you up to speed with the realities and benefits of AV1 Codec? Are you batting above average for your live services? Are you on par when it comes to stopping video piracy and combatting low latency? This session will address these questions and more, including live demos. OTT and the ability to deliver content to any device, anywhere, and any time, continues to be one of the hottest segments in the market. What steps should the production team take to make sure content is optimised for small-screen delivery? And what back-end technologies play a part in cutting down latency and delays, creating customisable experiences, and enhancing the user experience? Bringing Esports to the “big screen” of TVs in the living room continues to become more attractive for both those who run the Esports leagues and events and those who have broadcast or cable channels. How does covering an Esports event differ from a real-world sports event? And how important will it be to traditional TV distribution outlets who want to connect with younger audiences who grew up consuming Esports content on Twitch and other online platforms? Recent innovations from leading technology providers are increasingly making use of virtualized machines, SaaS, and machine learning to offer the means for a production to become more efficient. How will these technologies change the way sports and other live events are produced and distributed? Marc Segar is director of technical services for NEP Australia, where he has worked for the last 14 years. He originally joined the team as a technical manager. With 25 years of experience in the industry, Segar is known for his exceptional engineering and systems design skills, as well as his talent for project management. Segar’s passion for television was discovered early on, when at the tender age of five he was discovered by his father trying to remove the back of their television set to see how it worked. After receiving his degree in engineering, he began his career in London at Channel 4. Working as a trainee on the maintenance team, Segar quickly moved on to the projects team where he assisted in the design of the UK’s first fully digital television station. He then landed a job with Formula One, which led him to get to know the NEP Australia team, who eventually persuaded him to move across the globe from London to Sydney. Segar notes that one of the most interesting projects he’s worked on in his career was building the world’s first fully IP-based broadcast precincts (The Andrew Hubs) in Sydney and Melbourne, along with four new all IP trucks and a brand-new network to run it all on. Driven by a passion for entertainment, Matthew Boughen has been at the forefront of production in Australia for over a decade – from television to live events, sports, and feature films. Boughen is the producer of the OPL (Oceanic Pro League) with Riot Games, bringing a unique combination of live broadcast and event production to audiences online. Finn Bradshaw has been helping organizations with their digital strategy since the days of dial-up. He currently leads Cricket Australia’s digital division, which includes an independent newsroom that covers cricket across the globe. Prior to Cricket Australia, Bradshaw headed News Corp’s national AFL (SuperFooty) and racing (SuperRacing) networks, before becoming its first national digital sports editor. While there, he was a two-time Quill winner for best use of the online medium. In a varied career, Bradshaw has been founding editor of Triple J’s magazine JMag, a sports reporter, and the author of a bar guide. He still pinches himself that he gets paid to watch, talk, and argue about sports for a living. Mads Brown is brand manager and team captain of the mixed Counter-Strike team Supa-Stellar which focuses on fostering female talent and creating a more gender inclusive esports scene. Her role includes playing competitively in the team, as well as strategic management for the players. branding, and content. Brown also works at Supanova Comic Con and Gaming in sponsor acquisition and with Fox Sports as an interviewer for the FIFA ELeague. Steve Davis is the chief revenue officer for Ooyala, a provider of software and services that optimize the production, distribution, and monetization of media. He is responsible for global sales and marketing execution. Davis has over 25 years of sales and marketing experience in both emerging and established technology companies in the media and entertainment, enterprise, broadcast, and telco industries. He is focused on driving superior business value to customers and helping them find new and innovative solutions for the future of television. Clive Dickens joined Seven West Media (ASX:SWM) in 2015 as the chief digital officer for Seven West Media and as a non-executive director at Yahoo 7. He oversees all strategic and operational aspects of Seven West Media’s digital content and digital revenue activities. Dickens’ career to date has been a unique digital/broadcast media hybrid and boasts over 30 years’ experience, which has taken him from New York to Los Angeles, Mumbai to Johannesburg, Budapest to Berlin and London to now Australia. Dickens’ first digital role was in 1995 with the multi-award winning team at Capital Interactive, which was part of one of the largest broadcasters in the UK. Dickens was an advisor to the founders of the mobile company Shazam. He has also advised a number of other successful digital start-ups, helping them achieve growth, maturity, IPO, or exit. In 2008, Dickens co-founded Absolute Radio for the Times of India, an English language newspaper publisher, as COO. He was also a founding director of UK Radio Player, a joint venture between UK Broadcasters and the BBC that is used each month by 6m users to simplify the discovery of live broadcast content. In April 2013, Dickens relocated from the UK to Australia to take the reigns as director of digital and innovation at Southern Cross Austereo (SCA), overseeing strategic and operational aspects of the company’s diverse and multifaceted digital content and free-to-air television platform. During the 20 months Dickens was at SCA, his digital team achieved a 700% increase in digital traffic, which in turn drove a 50% increase in digital revenue and EBITDA by over 90%. Dickens is one of the founder directors of Code Club, a not for profit after-school coding club for Australian primary school children funded in part by a grant from the Telstra Foundation. Stephen Edwards is the head of technology for Fox Sports Australia. He works with a team of dedicated professionals to deliver the future of sports broadcasting. For the 18 years since becoming a broadcast engineering graduate of the UK’s Ravensbourne College, Edwards has steadfastly refused to get a proper job and has instead remained in the television industry, predominantly in sports broadcast as an engineer and proud technology nerd. Michael Fay has over 15 years of management experience with new media and online content strategies. He has been part of countless landmark developments related to Internet delivered content, having developed and supported a broad range of Internet-based solutions with exposure to enterprise, education, broadcast, and professional sports clientele. Past success stories include successful deployments of online programming (OTT/VOD) for global broadcast brands, international software support, and flash crowd management for the largest live events and game launches in Internet history. Fay has held global management positions with a focus on product and program management and has worked internationally for various global technology companies that deliver Internet and software solutions. He maintains a sustained focus on developing new markets, providing growth strategies, and succeeding in the execution of business plans. Academic achievements include a graduate degree in international business management, various professional certifications, and an undergraduate degree in marine transportation. Dane Gambrill has enjoyed a career in information technology that spans 18 years in IT operations, sales, and marketing roles across various business domains at IBM. Throughout this time, Gambrill has become an industry subject matter expert for media and entertainment, where he is a member of the Global IBM M&E strategy team and has deep expertise in business transformation to help clients compete in this digital era. Gambrill is also part of IBM’s business and technical leadership community, staying abreast of new and emerging technologies and how they will impact the future of clients and society. Gambrill also serves on the boards of a few organizations with core businesses in video production, music recording and publishing, education, cable, and satellite broadcast that spans into 170 markets across the globe. Philipp Hey started his career with an audio engineering background at Lawo GmbH Zurich/Switzerland back in 2007 as the international sales and project manager. His main focus was on the key accounts from the TV and radio businesses in South and Eastern Europe, Russia, South East Asia, and Australasia. Since 2016, Hey has filled the role of sales director in Russia and Asia Pacific. He is part of the product management team for Lawo’s IP broadcast infrastructure technology. Hey has responsibility for the entire Lawo product range and is addressing applications such as TV production and OB vans, radio on-air, IP broadcast infrastructure, theatre, and control systems in his territories. Rebekah Horne is the chief digital and information officer at the National Rugby League and has 20 years of experience in digital, telecommunications, mobile, and media companies. She is responsible for the build, delivery, and execution of the NRL’s digital strategy across the game. Prior to joining the NRL, Horne was the chief digital officer of Network Ten and before that the chief executive officer of LA-based start-up Topfloor.com. Between 2006 and 2011, she was responsible for the internationalization of News Corp’s digital business, Fox Interactive Media. Horne is also a non-executive director at Greencross (GXL). Adrian Jenner is the head of technology at Gearhouse Broadcast. He is responsible for the research and development of new broadcast and communications technologies, driving strategic technology decisions, project development, and tender response. Jenner is skilled in design and optimization, as well as QA in broadcast/IT environments. He has a comprehensive understanding of multi-format broadcast, streaming, RF, and IP technologies. Jenner also has design and implementation experience in major broadcast projects in a lead capacity. His specialities include remote production, systems design, project management, compression, broadcast computing, networking, large production facility service integration, RF, fibre infrastructure, non-linear editing, and MAM systems. Dr. Stephanie Kovalchik is a senior data scientist in the Game Insight Group at Tennis Australia and a research fellow at Victoria University. Her research focuses on the use of statistical methods to understand performance, game strategy, and mentality in high-performance tennis. Kovalchik received her PhD in statistics from UCLA and her Bachelor’s of Science from Caltech. Kovalchik is also the creator of the tennis analytics blog On The T (on-the-t.com) and regularly writes about tennis there and on twitter @StatsOnTheT. Will Law first joined Akamai back in 2008 and has since risen through the ranks to become the CDN’s chief architect of media cloud engineering. Based in California, he is responsible for supporting new and strategic initiatives for the Media Cloud team, including MPEG DASH, mobile, connected devices, HTTP adaptive streaming, HLS, and security. He has worked in the streaming media space for over ten years and wrote many of the early connection frameworks that still drive much of the traffic flowing over Akamai today. Law holds a master’s degree in aerospace engineering from Georgia Institute of Engineering. Anna Lockwood is an experienced media industry executive specializing in sports and broadcast consulting, and is currently the head of market development at Telstra Broadcast Services. Lockwood has had previous global leadership roles in London, Singapore, and Boston, and now works at Telstra at the convergence of the traditional broadcast industry and leading edge telecommunications and digital platforms. In addition to her role at Telstra, Lockwood is on the board of SMPTE (Society of Motion Picture and Television Engineers) Australia Section, represents Telstra as a director on the IABM (International Association of Broadcast Manufacturers) Board, and is a board member of EGAA (Esports Games Association of Australia). She brings her interests in innovation, sports, and women in technology to her board and industry engagement. Jon Marquard heads up Janez Media which is a specialist sports, digital, and media advisory practice. He has 20+ years of operational and strategic experience across digital, telco, pay TV, and FTA Television. Janez Media works with and has been engaged by a range of international and Australian entities on OTT strategy and digital content negotiation, as well as implementation including Showmax, Optus, MultiChoice, MLB, Nine, the NRL, Sanzaar, Mediacorp, and Intigral. Lewis Mitchell is the partnerships associate for Australia and New Zealand at Twitch where he oversees the on-boarding and management of content creators in the region. Prior to Twitch, Mitchell was the product specialist at Spiral Media, now known as Showdown, managing distribution of Twitch media in the Asia Pacific region. Before that, he was the ad product executive at Nine Entertainment. Mitchell is a graduate of the Australian Film, Television, and Radio School. Carl Petch is the principal solutions architect for Telstra Broadcast Services, and leads the global Broadcast and Media Solutions Architecture team. Over the past two years, he has also been deeply involved with the design and build of the new Telstra Broadcast Operations Centre in Sydney, the hub of their global media operations, and has contributed to the development of the Telstra Global Media Network. Petch is internationally recognized as an evangelist and expert on broadcast and IP. He has consulted with many of Telstra’s customers and partners on the move to IP for broadcast operations and remote production workflows. Prior to Telstra, Petch had senior roles in the UK and Australia with Sky Racing and Globecast. Todd Procter is the head of innovations and OB special events for Fox Sports Australia. He has worked at Fox Sports for 22 years moulding a passion for television creation with technical innovations. Prior to Fox Sports, Procter worked at a free-to-air television network (Channel 9) for 11 years, starting his career in television as an apprentice broadcast engineer. When the Big Bash Cricket Tournament was created (2012), Procter introduced innovations like the live cricket umpire cap camera and live batter camera to the screens. In addition to the world’s first live HD drone into sports productions (2013), Procter introduced corner-post cameras into NRL and Rugby Union, a Rugby League referee camera, an augmented reality Bathurst Supercar companion app (Fox Vision), and many other technical production enhancements. Procter is currently working on the Fox Sports Distributed Production HUB Project with NEP. Dominic Remond has over 30 years of experience in the sports, entertainment, media, and marketing fields, including successful senior management positions with Cricket NSW, Sony Pictures, Glaxo SmithKline, and SC Johnson. He is a former member of the Male Champions of Change Sport and former general manager of the Sydney Sixers, the reigning Women’s Big Bash League Champions. Remond recently commenced as CEO of Gfinity Esports Australia. In 2011, Stuart Taggart founded Australia’s first sports business futurist agency, Relevant Innovation. He is now the CEO of Envision, a progressive consultancy advising C-Suite executives on transformation opportunities within the sports, media, and entertainment industry. Taggart has worked with a diverse international client base in recent years including NRL, Cricket Australia, Telstra, Australian Sports Commission, Sydney Cricket & Sports Ground Trust, Network Ten, Lion, VenuesLive, Red Bull, PGA Australia, Australian Rugby Union, Tourism Australia, and Stanford University. Nathan Taylor is the director of technology at Optus. Taylor’s team develops the Optus Sport Platform which is the exclusive way to watch the Premier League in Australia. Optus Sport is the first platform in Australia to broadcast a mainstream international sports league exclusively using OTT technology. Taylor has worked in the video streaming industry for over 15 years and has developed a mixture of general entertainment products and specialized sports products in the Australia, U.S., and Middle Eastern Regions. With over 10 years of experience in the digital sport sector, Kane Washington is the general manager of sports products at Telstra. Washington leads the team responsible for the design, build, and operation of some of the biggest sports digital properties in Australia, working with partners such as the AFL, NRL, and Netball Australia to connect millions of sports fans and Telstra customers with their passions. Prior to his current role at Telstra, Washington worked at Cricket Australia for seven years in the digital team, a previous stint at Telstra and Accenture. Scott Wenkart is the founder and managing director of gaming media specialist Showdown. Wenkart has been a major driver in bringing media into gaming within the oceanic region. In 2013, Wenkart created a partnership between Twitch TV and Showdown to provide Twitch with a local presence. Prior to Twitch, Wenkart launched and built teams to develop the media businesses for IGN Asia and EA Games Media. Wenkart has dedicated his career to the adoption of technologies to enable meaningful communication for both communities and brands. Through the success and growth of Twitch, Wenkart and his teams at Showdown have been able to connect Twitch’s live stream platform to a community that has evolved from gamers watching live game play to the largest live social video platform and live esports platform globally. Showdown now operates several business units including the Twitch.TV Media, an esports division running programs and leagues including Throwdown Esports, and Showdown Studios which provides live broadcast studios and production for esports and content creators.